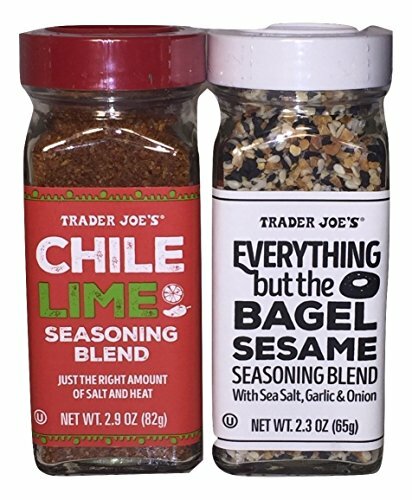 A fabulous bundle of Trader Joe's Popular Seasonings - includes one 2.9 oz shaker bottle of Chile Lime Seasoning Blend and one 2.3 oz shaker bottle of Everything but the Bagel Sesame Seasoning Blend. Chile Lime Seasoning is a blend of salt, chile powder, and lime juice powder. Sprinkle on fresh-cut fruits and veggies-watermelon, mango, coconut, oranges, jicama, cucumbers. An excellent dry rub for BBQ and grilled fish.